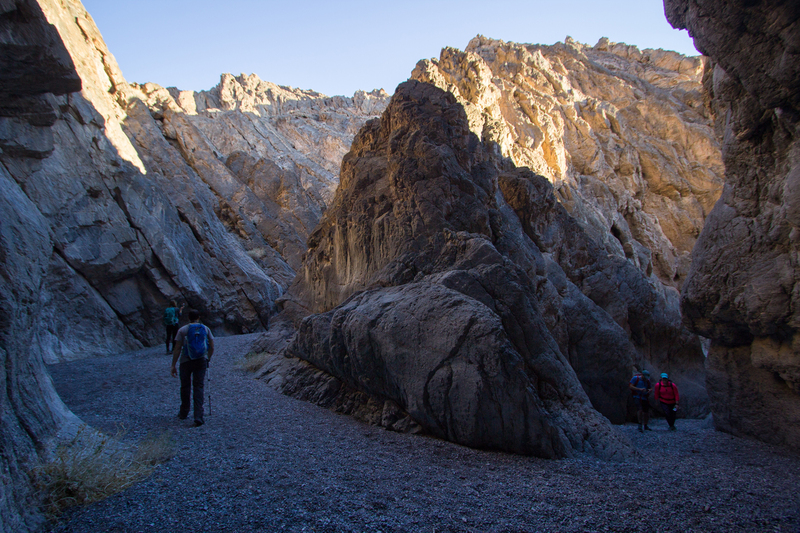 After spending a few hours driving through Titus Canyon I think everyone was ready for a hike to stretch our legs. 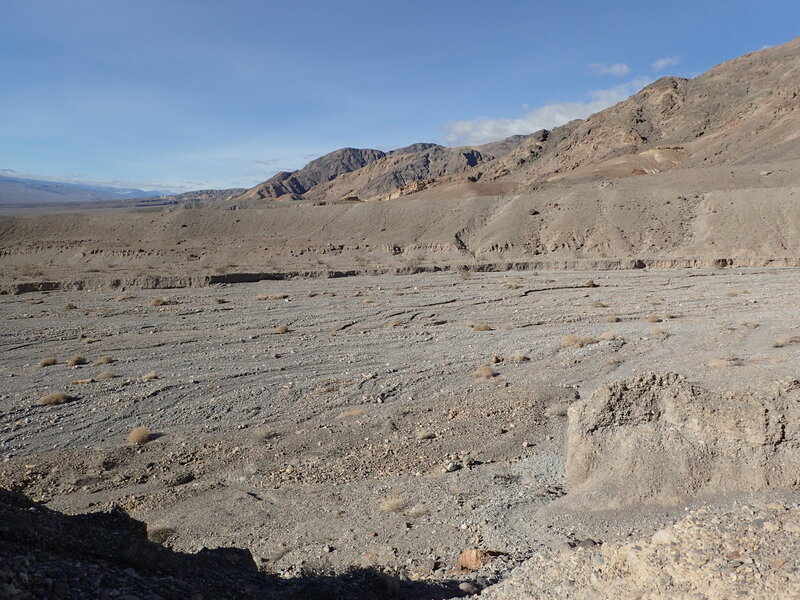 Normally from this trailhead most people head over to Fall Canyon which is a relatively popular destination in Death Valley National Park. 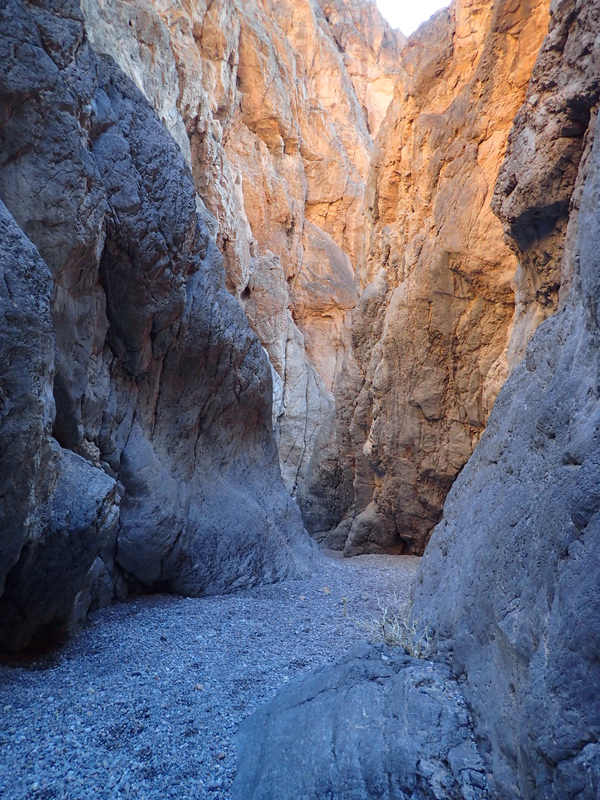 However, we decided to go with a lesser known slot canyon just past Fall Canyon which I believe is called Palmer Canyon. This hike is generally unmarked and without seeing it on a map you would probably not know it was there in the first place. We packed up our gear pretty quickly and headed up the worn trail just past the restroom at the trailhead. 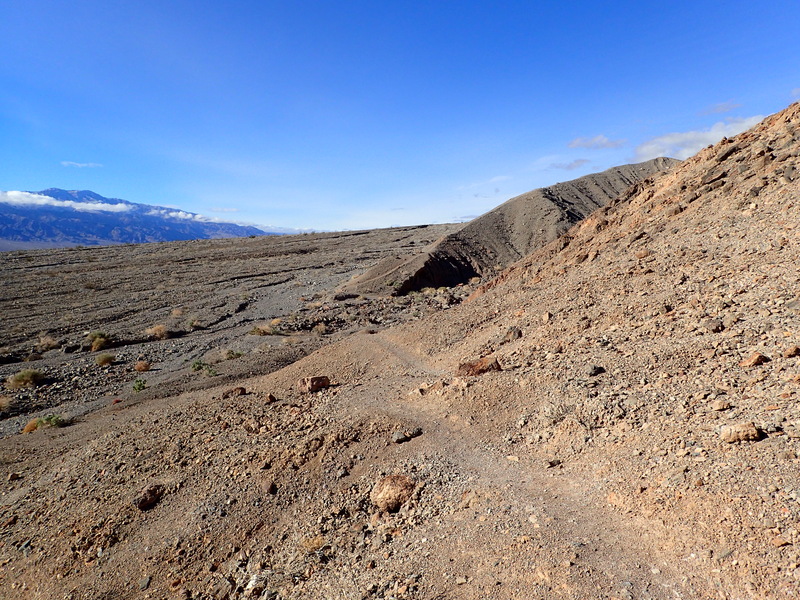 The well worn trail at the start of the hike. 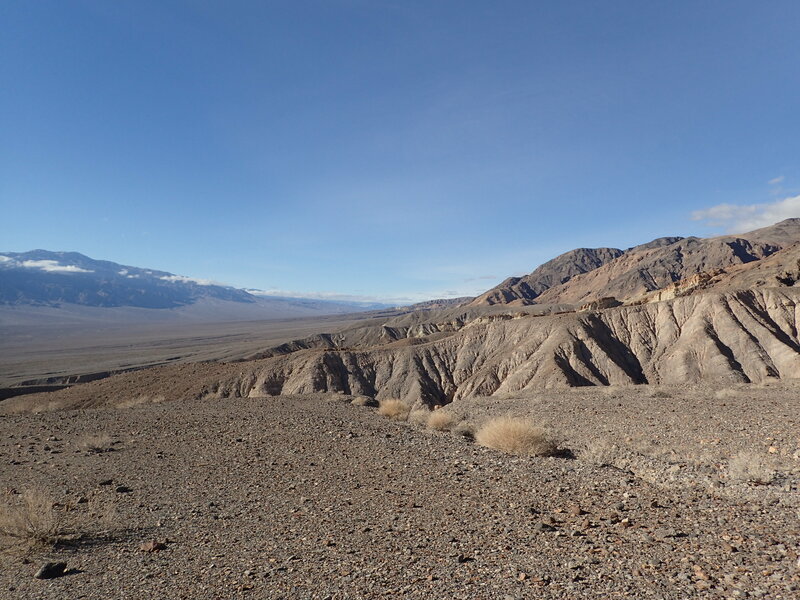 The trail follows the path of least resistance over gently rolling hills while leading you along the edge of the mountain and down towards the washes and canyons beyond. 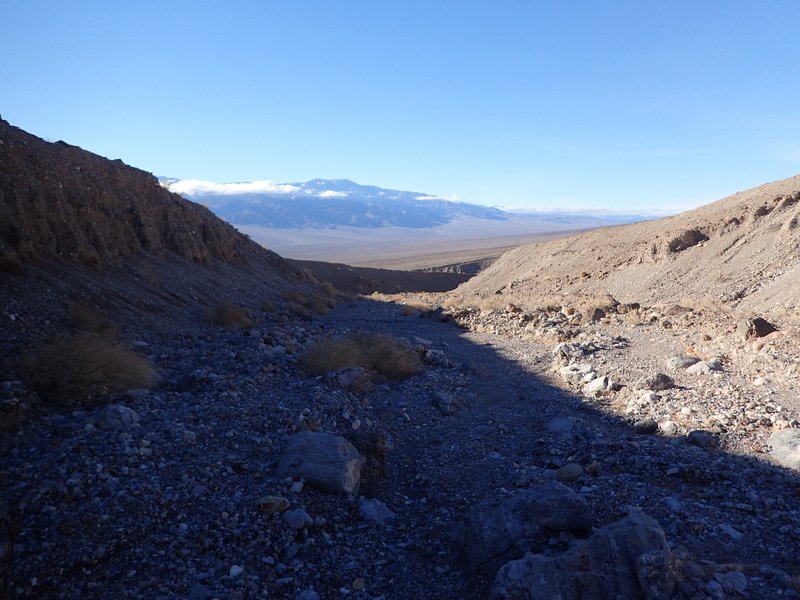 The start of the trail is the same one for our objective as it is for Fall Canyon. Looking down the trail near the start of the hike. 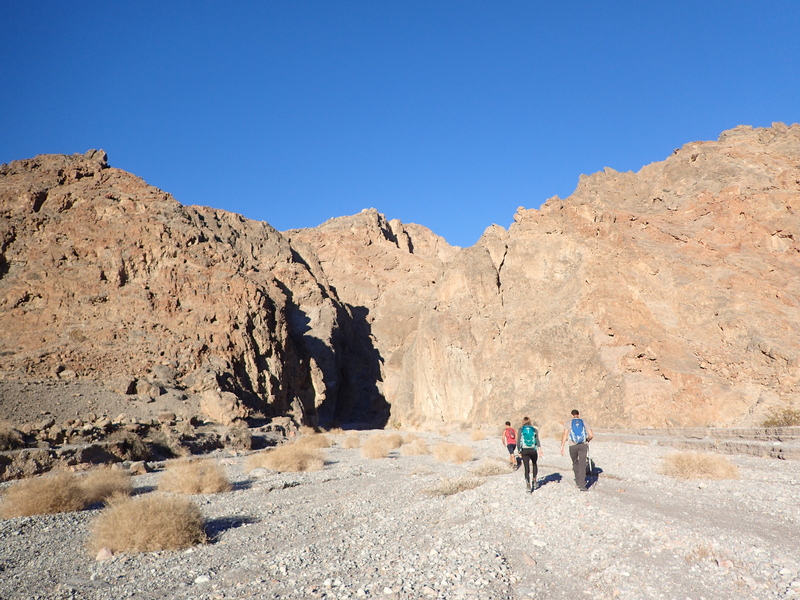 It was snowy in Titus Canyon but once we got into Death Valley proper the sun was shinning bright and shorts and a t shirt had become the perfect hiking gear. It was nice to have a change of pace hiking in such beautiful weather compared to the -20° wind chills of the northeast in January. The view looking off to your left as you hike down the trail. 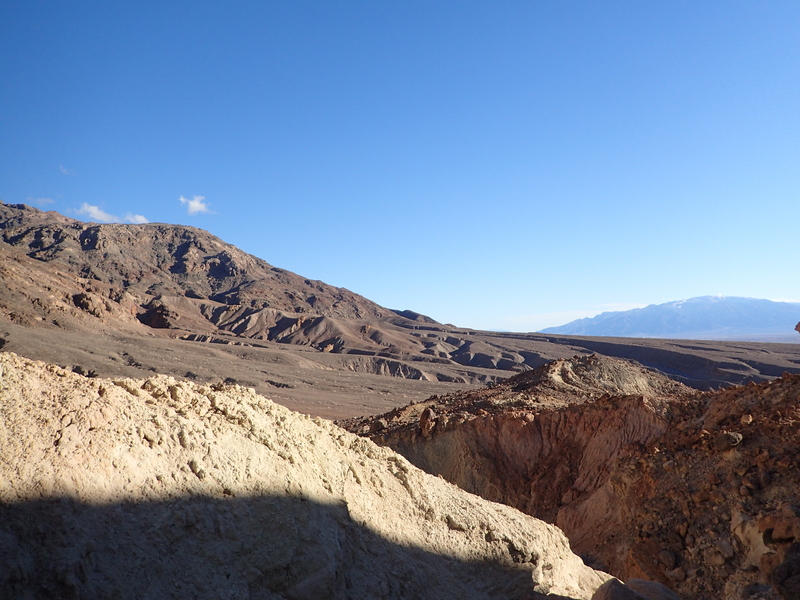 The views were also incredible with the dry desert under our feet and snow capped mountains off in the distance. 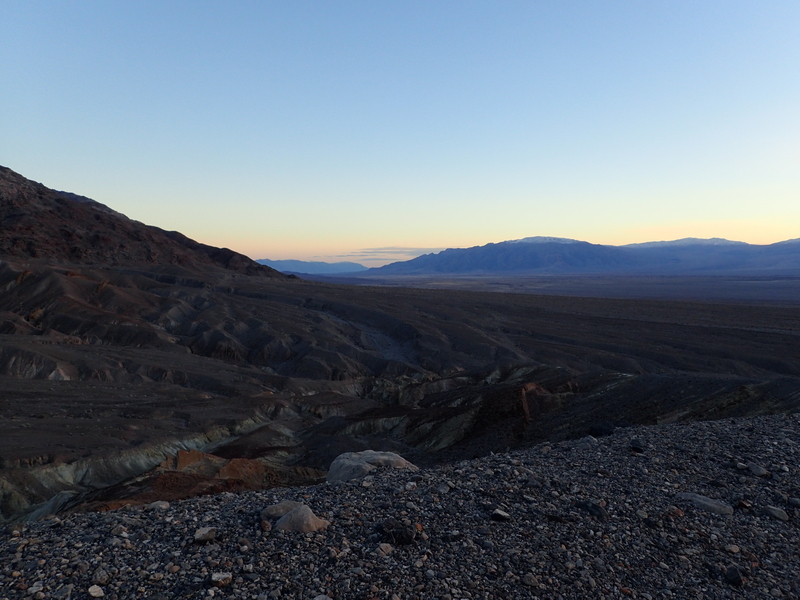 There is just something special about Death Valley that makes me always want to come back again and again. 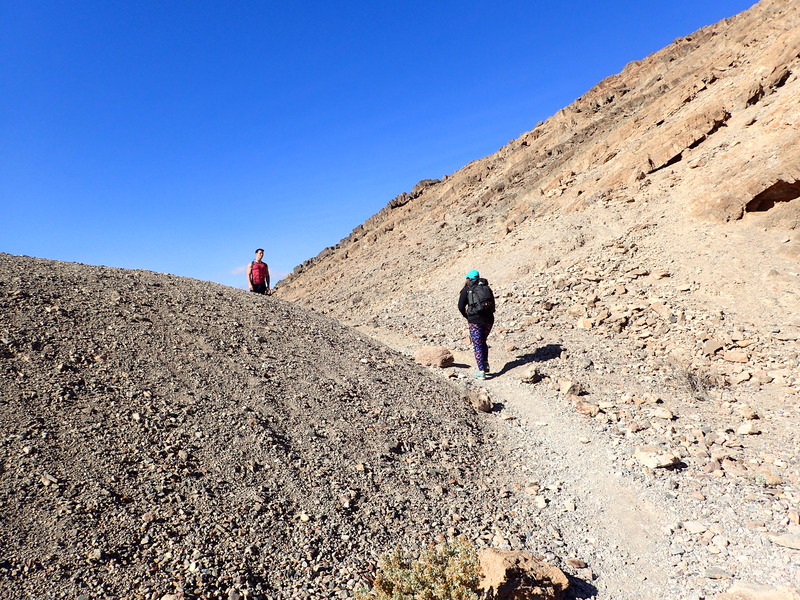 The hiking from the start of the trail was pretty easy and straightforward. 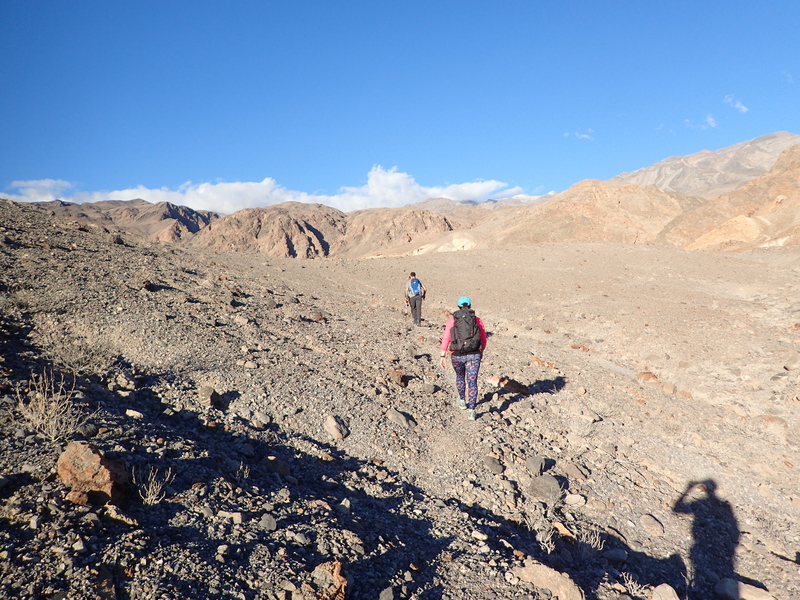 We simply followed the obviously worn path and after a few minutes we reached the first major wash we had to cross. 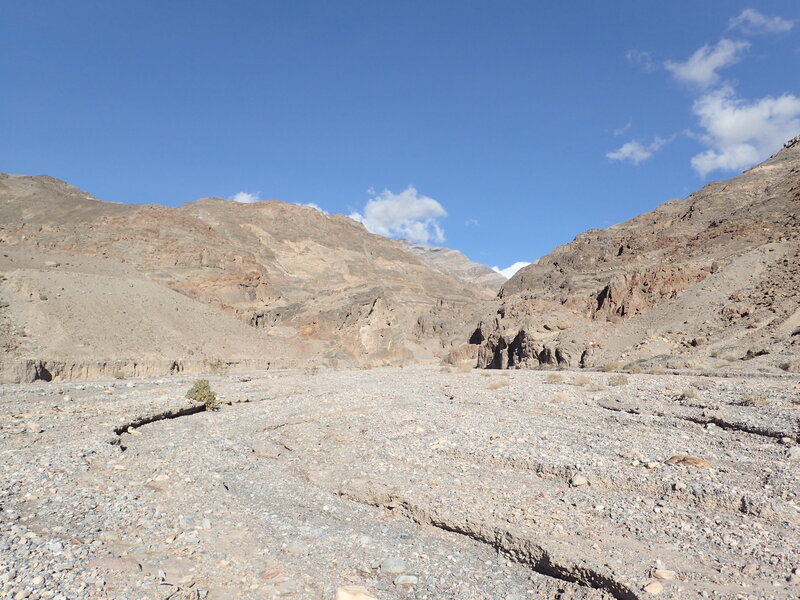 The first major wash we had to cross and also the junction for Fall Canyon. We walked down the hill and into the wash and made a beeline straight across. 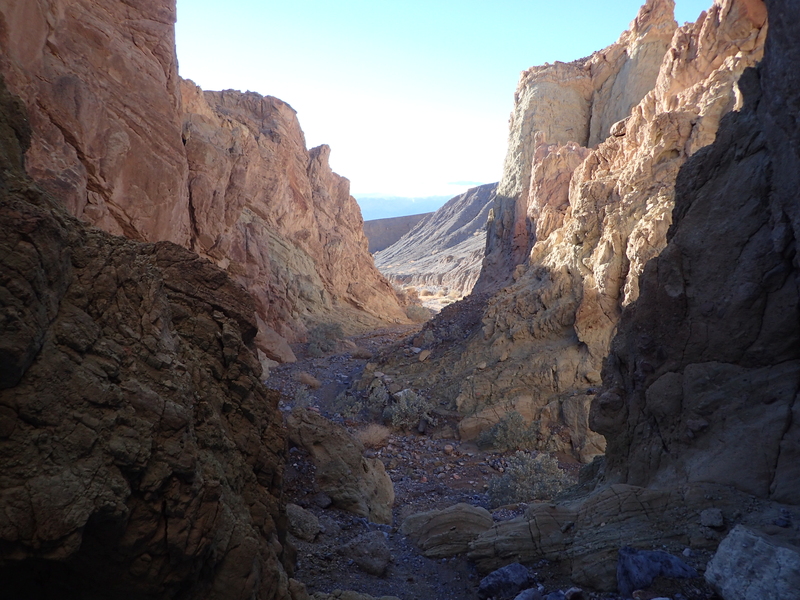 If you were looking to hike Fall Canyon you would hang a right up the wash and towards the canyon. 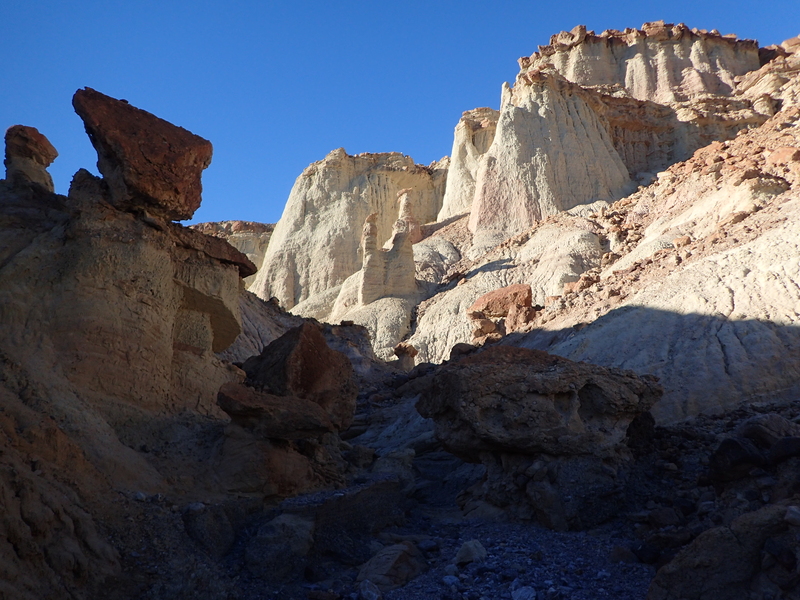 Looking up towards Fall Canyon. Once on the other side we looked around for an obvious path up the other side. After a little looking we found what looked like a tiny cairn and the path of least resistance up the hill on the other side. View of the trail as we exited the wash.
From here we walked straight up to the top of the hill where we were able to take in the rest of the hike ahead of us and figure out our general direction. From the top of the hill you could see the next wash on the other side that curves like a crescent moon. 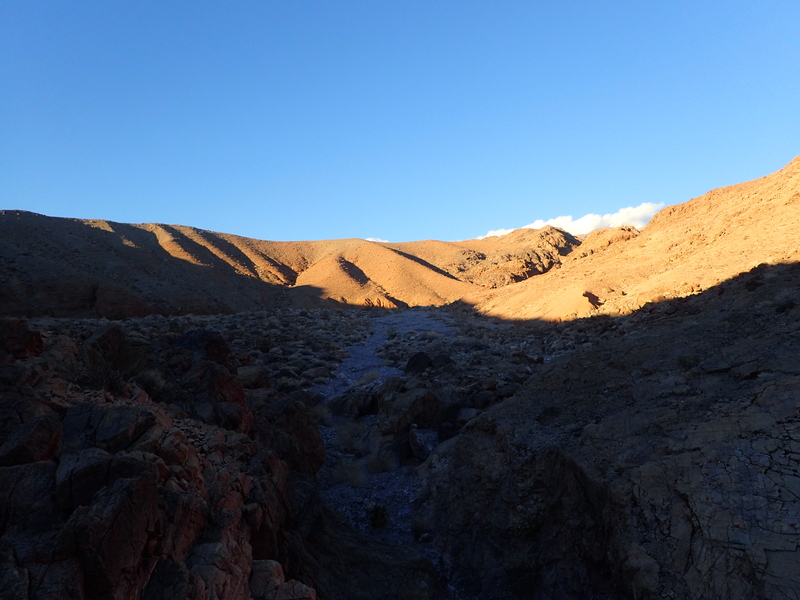 This wash was what we wanted to follow up and towards the entrance to Palmer Canyon. View looking towards the next wash we had to follow. 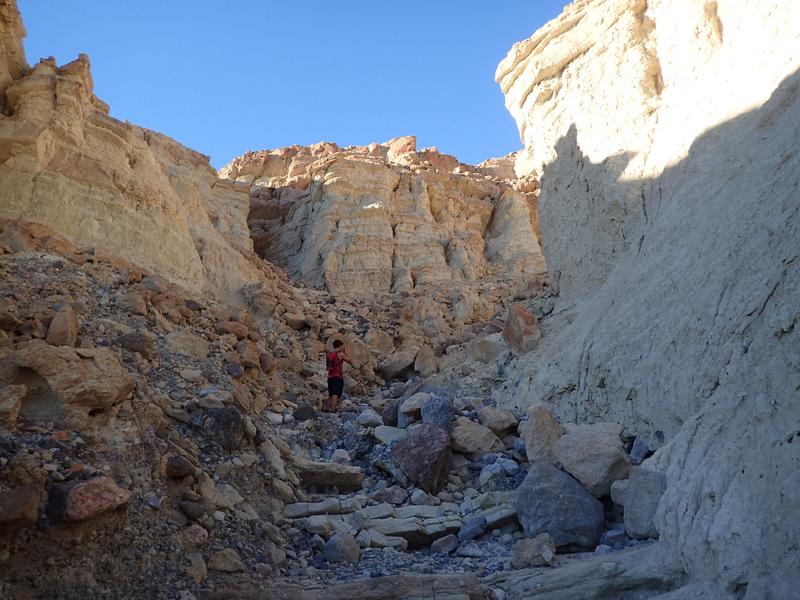 Once we got down into the second wash it was a gentle downhill hike through loose rock. Luckily the wash creates a pretty clear and easy to follow path. 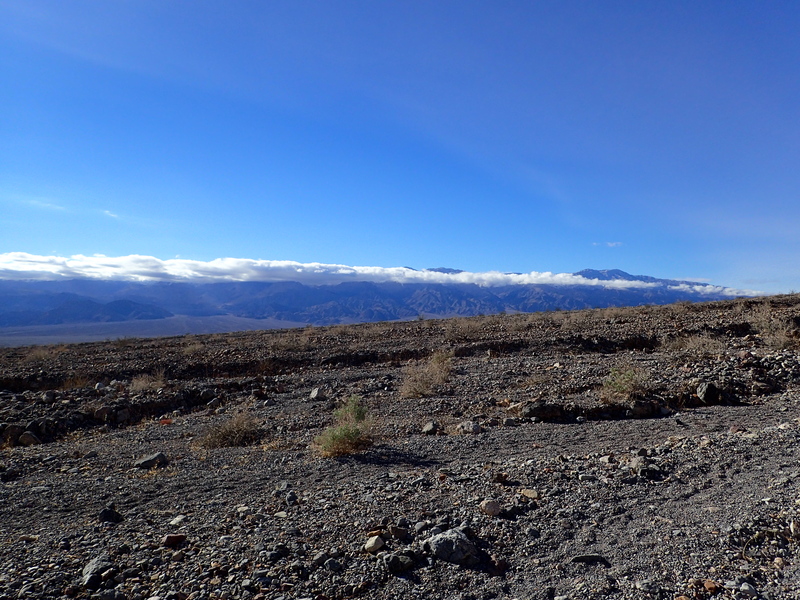 There were occasional cairns along the way but they weren’t always obvious or easy to follow so you want to make sure you keep a mental note on where your headed. View from inside the second wash.
We made our way down the wash pretty quickly and before too long reached a section where it began to narrow. From here the trail became a bit harder to follow and I am fairly sure we ended up going a harder route than was necessary. Approaching the end of the wash. Taking in the views from the narrowing canyon. 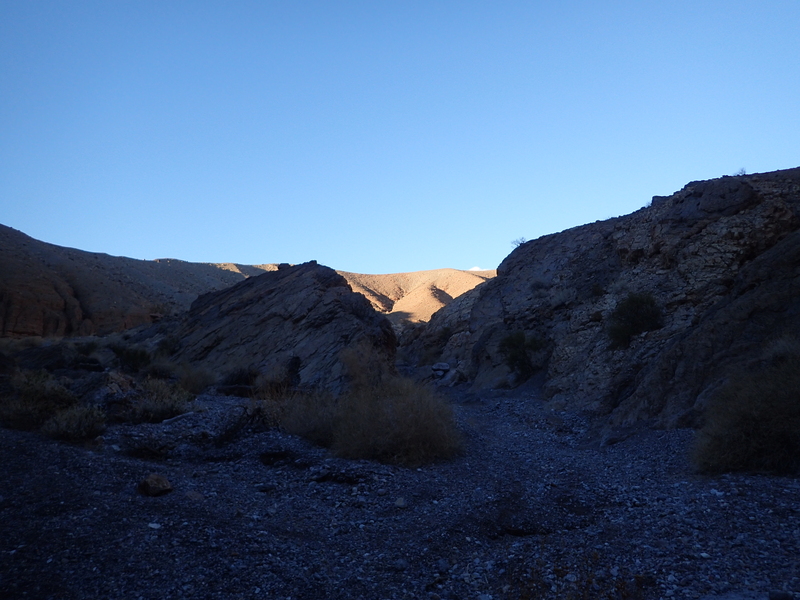 From this point the hike went through a smaller canyon made of crumbly mud stone and loose rocks. 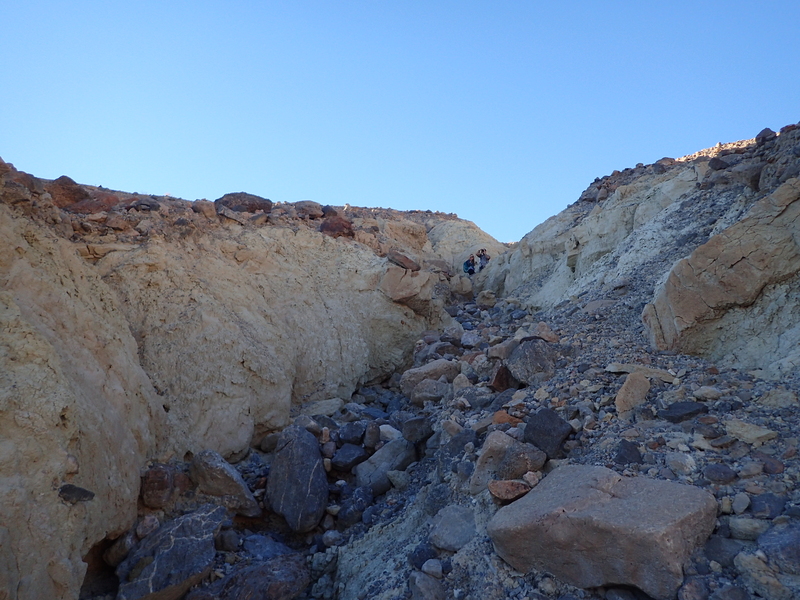 We would later learn there was another way up and around these steep mud gully’s but at this point we were committed to heading up one to find the entrance to Palmer Canyon. 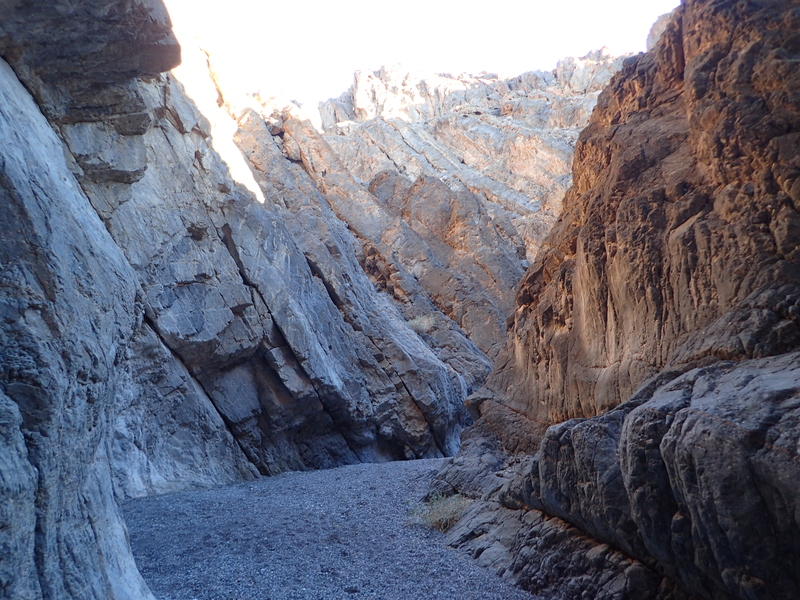 Looking up the canyon as it narrowed. From here there were multiple gully’s we could have climbed but we simply picked the one we happened on first. Unfortunately I don’t remember exactly which one but we did pass a formation that looked an awful lot like a mini Bryce Canyon in the making. Mini Bryce Canyon in the making. The “trail” up the canyon continued to get steeper as we worked our way up to the top of the ridge and despite all the loose rock it wasn’t too hard following the path of least resistance. 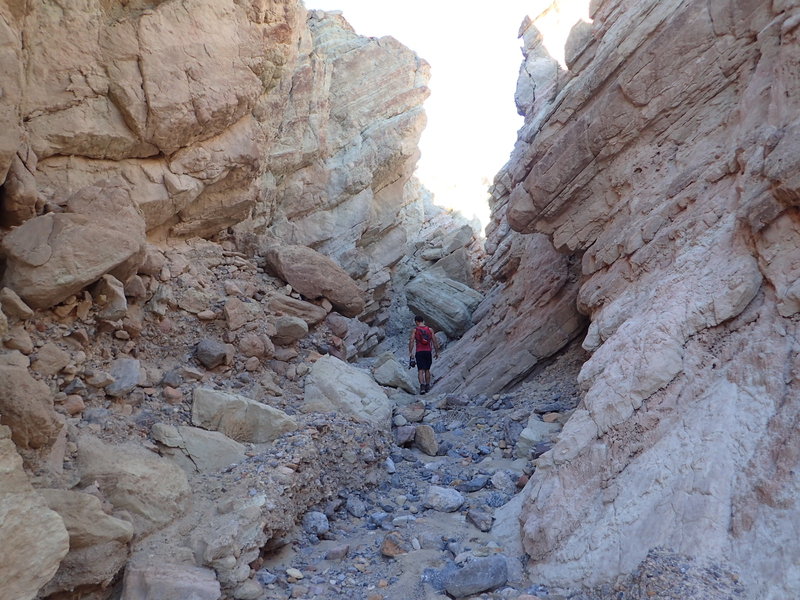 Working our way up and out of the narrow canyon. The views also got better and better as we worked our way out of the canyon and could see back the way we had come. Looking back the way we had come. The trailhead was back over the furthest ridge in the photo. Stav stopping for a quick photo. 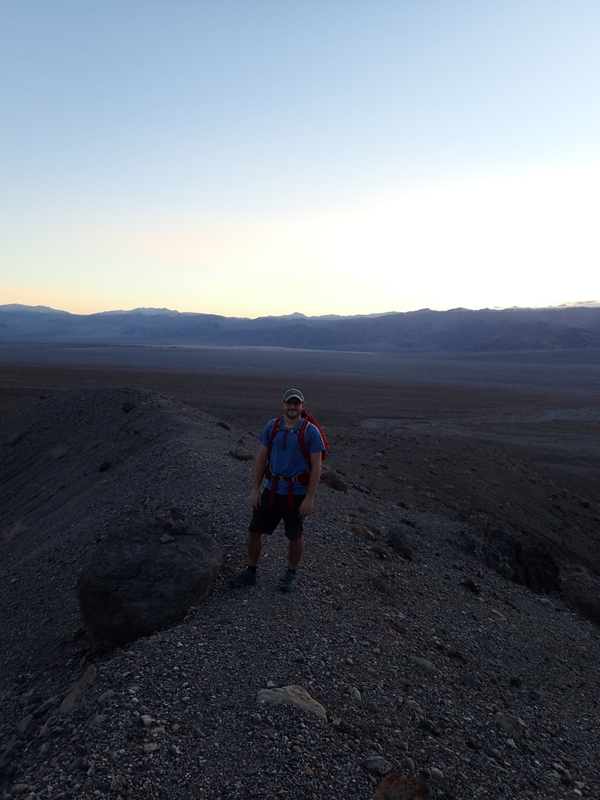 Before too long we reached the final steep section before topping out on the top of the ridge. The final section required a nice scramble up a lot of loose rock. Final steep section exiting the narrow canyon. 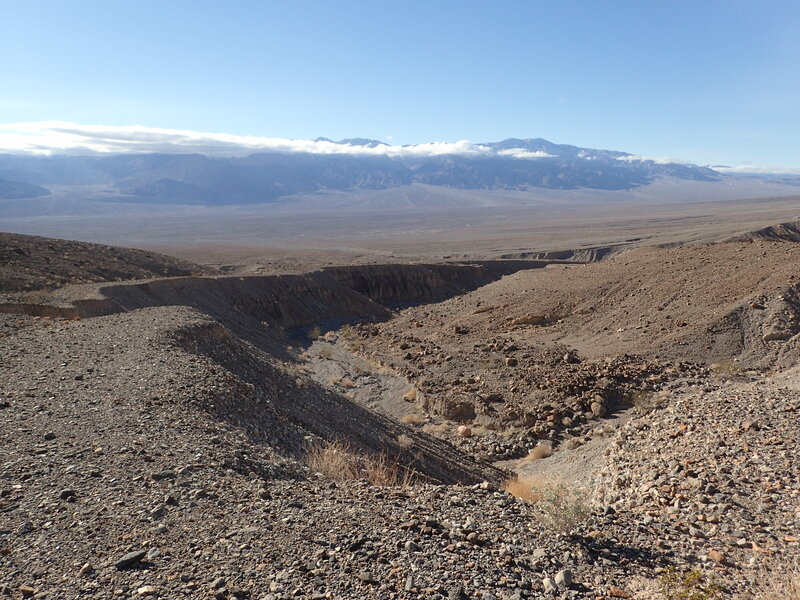 Once on the top of the ridge we could see a faint trail that lead to another wash and the canyon entrance beyond. 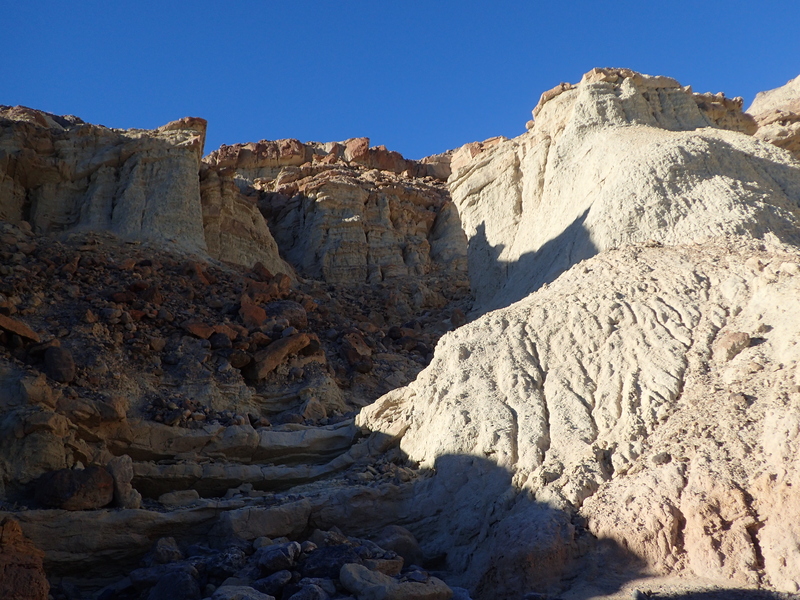 Following the faint trail towards the third wash and the canyon entrance. After this short section we reached the third wash which was smaller than the last two and lead to the entrance of the canyon. 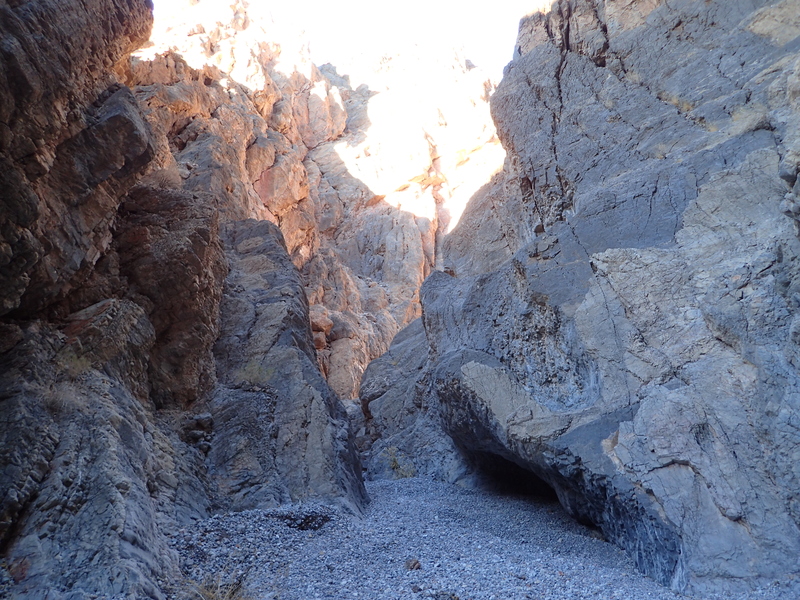 We made a right down and into the wash and up towards the canyon entrance beyond. Walking towards the entrance to Palmer Canyon. Palmer Canyon itself is a fun little slot canyon which offers a nice quiet alternative to other more popular canyons in the park. From the mouth of the canyon it is an obvious path up the narrow canyon which offers plenty of beautiful views and cool rock formations. 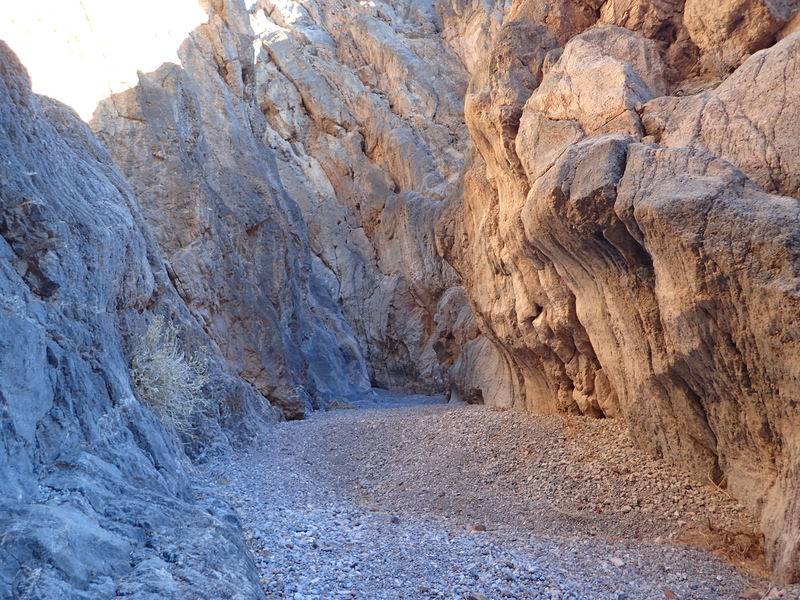 Instead of wasting your time with useless descriptions, I will just post several pictures of the narrows section below! Humans for scale. Photo courtesy of Stav. 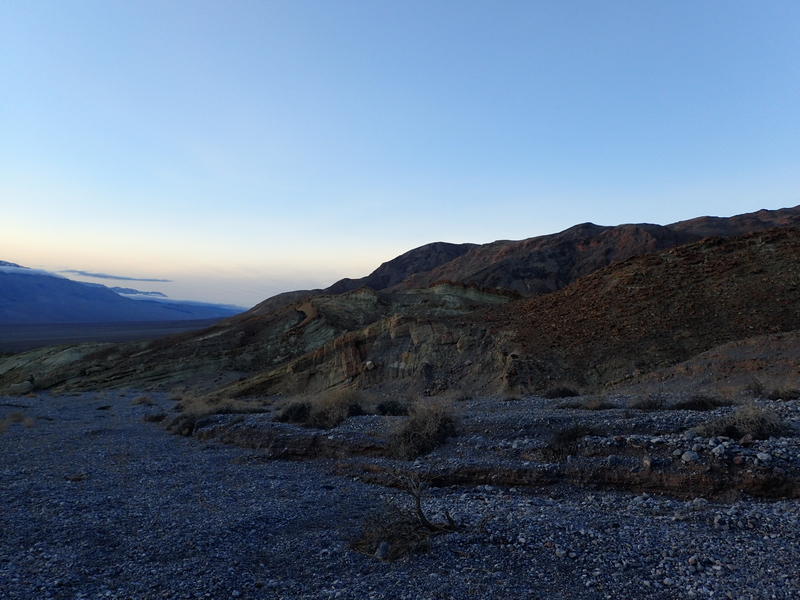 After a short hike up the canyon we reached a large clearing where we decided to stop and take in the views. From here the canyon continued on beyond but as the sun was already going down we decided to just head back so we could get through the steep section before it got too dark. From other photos I have seen it looks like this clearing also gets lots of yellow wild flowers in the spring time. View of the clearing and canyon continuing beyond. 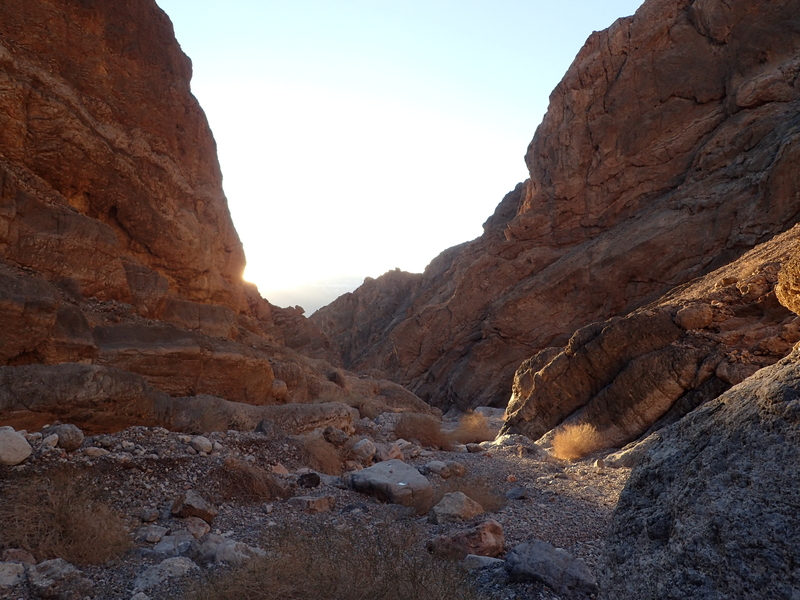 We made quick work heading back down the narrows and made it to the mouth of the canyon as the sun was getting low in the sky. View exiting the narrows section. From here we back tracked back out of the wash and up the hill we had descended on the way in. 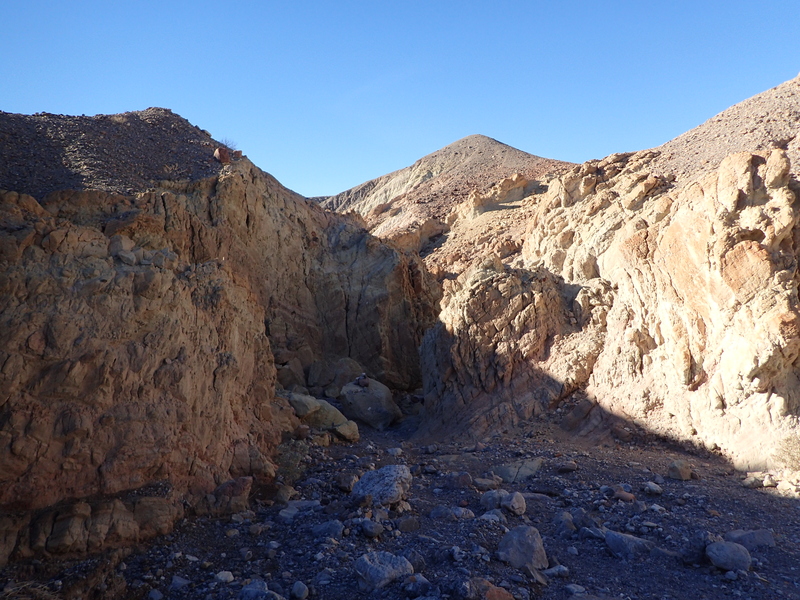 We thought we would have to go back down the narrow mudslide we climbed up but from this vantage we could now see the feint trail along the top of the ridge. View as we exited the narrows. Looking out from the wash before heading back up the hill. View from the trail on top of the ridge. It turned out this trail on the ridge went all the way from Palmer Canyon to the crescent shaped wash, avoiding the steep gully entirely. 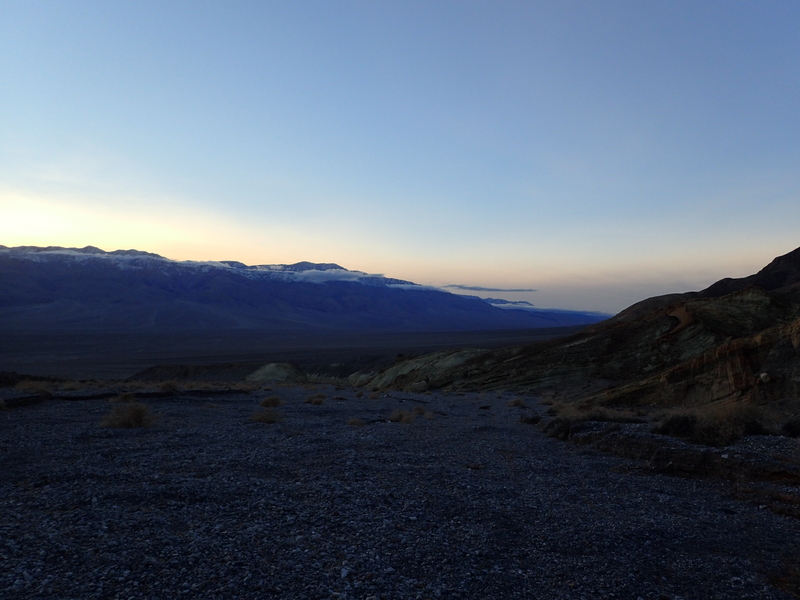 I am glad we went up the way we did but this turned out to be a beautiful hike out watching the sun set over the valley beyond. Kelly enjoying the beautiful scenery. I had to get my own photo as well of course! 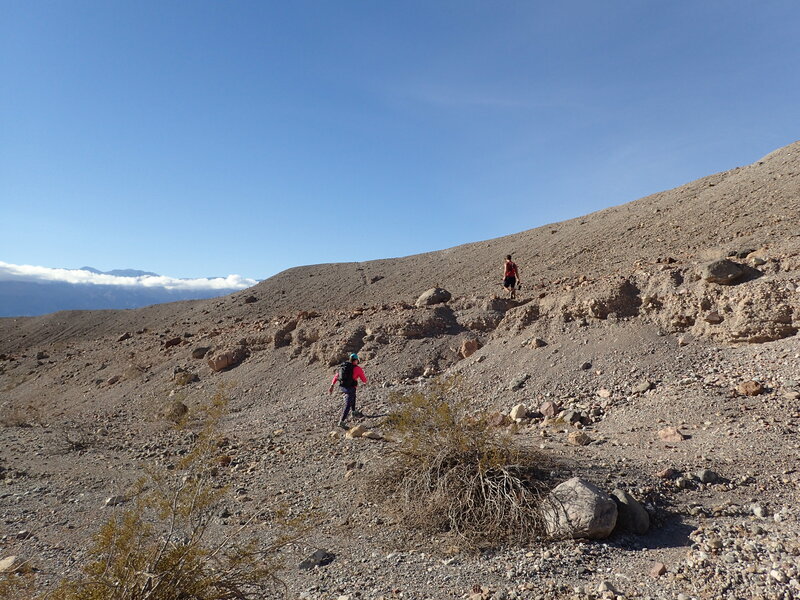 When we reached the end of the ridge trail a short scramble down the scree covered hill dumped us back into the crescent shaped wash. There probably was another way out and around going back into the wash but given the lack of light we figured it would just be easier to go back the way we had come. From here we followed the same path out that we followed in. We ended up finishing just as the stars were coming out but the clear skies and bright moon made it easy enough to find our way in the waning light. 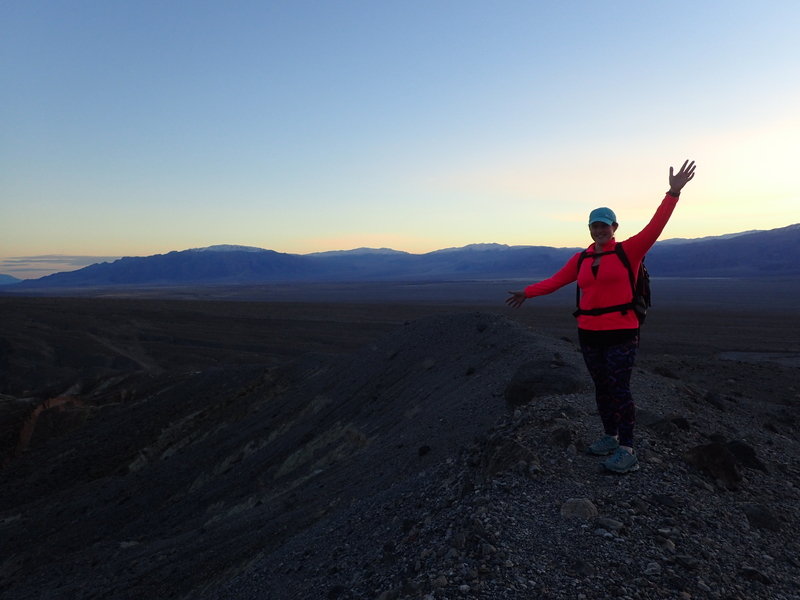 All in all it was a fantastic hike in a more out of the way portion of Death Valley National Park. I can’t wait to get back soon to explore more of the more obscure areas of the park.